Travel to the city of New York to encounter numerous criminals as a detective and defend the city from their crimes. Designed to resemble a comic book from the 1980’s, this games theme creates hours of entertainment. Designed by NetEnt, Jack Hammer Vs. Evil Dr. Wuten is presented in 5 reel and 25 paylines. 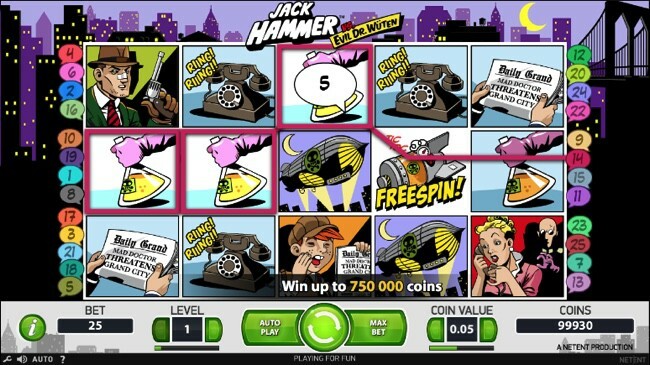 This game is filled with extensive features and a jackpot bonus of 250,000 coins. The available bonus features include wild symbols, re-spins, sticky wins and free spins. The theme displayed provides a classic comic atmosphere, where heroes from the 1980’s will create all the action on the reels. The symbols are crafted as frame by frame shots in a comic. Those available symbols include a bomb, the detective, his wife, the villain, a young boy, cars, newspapers, deadly potions, old telephones and cross-boned blimps. Jack Hammer gives a simple set of betting options that can cater to beginner or advanced slot enthusiasts. The lowest coin value that can be placed is $0.25, and the largest value is $10.00. As all lines must be played, the smallest bet that can be placed is $0.50 and the largest is $250.00 on a single spin. Jack Hammer Vs. Evil Dr. Wuten features some wonderful bonus elements that are designed to increase your wins and level of excitement extruded from this game, with each having the crime fighting ability to ensure the good guys always win, and the bad guys fail. Any winning spin will activate sticky wins. This triggers a re-spin to allow for additional symbols to fall into position on the reels to accumulate wins and will continue until no additional wins are accumilated or until a full screen of symbols occurs. The symbol denoted by the exploding orange red symbol with wild displayed across it is the wild symbol. It will substitute all on the reels with exception given to the Free Spin symbol. Wild symbols are available in both the base game and free spins. The free spins feature activates when a minimum of five free spin symbols display on screen. This will award 10 free spins with a 3x multiplier, however additional free spin symbols will increase the triggering number up to a maximum of 30. During the free spins, wild symbols can appear on reels 2, 3 or 4 to increase the potential of wins by acting as a substitute, this will remain sticky if a win occurs and re-spins will follow until there are no additional wins. The free spins can be re-triggered with all spins running concurrently until completed. Jack Hammer Vs. Evil Dr. Wuten gives slots enthusiasts sensational graphics resembling that of a comic book, stereo-surround sound effects and extensive bonus features. The additional opportunity of winning 250,000 coins makes exploring NYC well-worth the task. This game certainly provides an entertaining experience as you will be hard pressed to forget about this game. Having a medium volatility with a 95.61% payout percentage, this slot offers great benefits.